Calling all Superheroes! Join PADRES as we help support and raise funds for children and young adults with cancer. 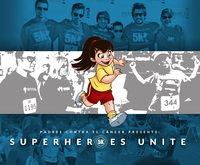 Come dressed as your favorite superhero and inspire our kids in their battle against cancer. Medals will be awarded to top male and female fastest runners regardless of age. There will be a sponsors village with live music and celebrity visits. Registration begins at 6 AM (see website for day before prior packet pick up); Race at 8:30 AM event ends at 11 AM. Proceeds for the event will go to support PADRES Educational, Quality of Life Events and Direct Family Support Services (i,e., transportation assistance). PADRES support children and young adults with cancer and blood diseases. Register today to walk or run and create a team and help raise funds to make a difference in the lives of these heroes!